Referral Program: We’d Like To Meet Your Friends! Our referral program is a great way for our wedding couples to get additional gifts from their wedding day. It’s a great way for all of our clients to enjoy special memories with new products that are exclusive to our referral program! Tell your friends, family, and co-workers about Carl Kerridge Photography! When they become part of the CKP family, you’ll receive a very nice “thank you” gift and always our gratitude. All the details about the our referral program are above. Have a question or other inquiries? Call: 843-333-1212 or E-mail: info@carlkerridge.com. Give Away For 2017 – Vote for Your Favorite Couple! This past year plays back like video film of my life, spotlighting some great friendships from my personal life blended with prosperous business growth. 2016 was a great year for us and I can not wait to tell our couples about this special give away to celebrate our success! One of the biggest lessons that keeps being ingrained each year is: Quality comes from separating the person from the contract. Each year I fall in love with my couples. To each of you, I want to let you know that I recognize your love in it’s many shapes and forms. Each year there seems to be a theme with my couples. This year yours would have to center around the quiet calmness that comes from deep intimacy. I have heard more heart felt speeches this year that rekindled and impacted me in such positive ways, and I think you all are amazing individuals. So let’s have some fun together to start off 2017. The rules are simple: the couple with the greatest number of voting comments on this post will receive a large 20×30 retouched fine art canvas delivered in time for Valentines Day. To all my readers, feel free to leave some love too because your are equally valued to me. Every individual who comments will be entered into a separate give away for a $25 Amazon gift card. Share to Facebook and Instagram, Tweet about this post, and get creative with spreading the word! I love a good laugh and I’ll be counting comments on ONLY this page’s comment section – one per person – until January 31st. The Winner will be announced Wednesday, February 1st and will receive a personal Valentine’s Day gift for their newly wed year! Someone’s favorite Disney movie must have been Cinderella, and why not? 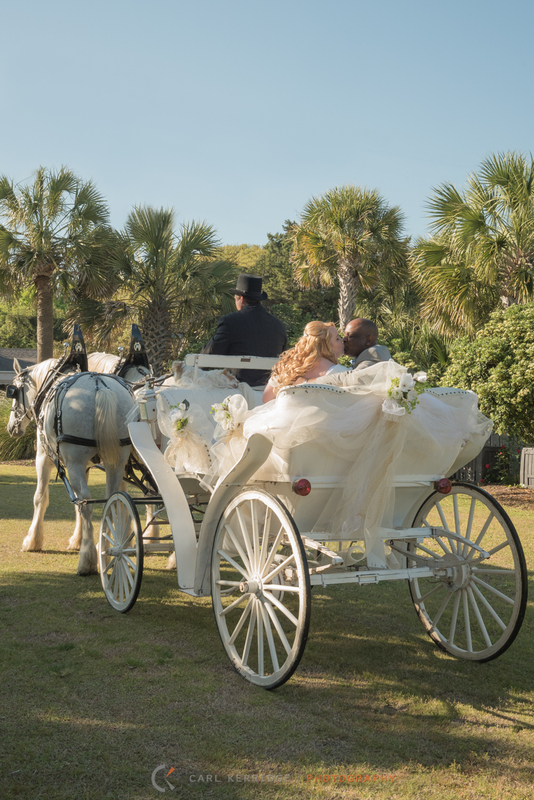 Cinderella and her prince got the wedding carriage ride, so our Myrtle Beach couple did too! Kerri and Jeffery are a fun couple. I couldn’t have thought of any better way to spend a Sunday afternoon. Everything about this wedding was magical, from jumping the broom to the sparkler exit. Adding the harpist for the ceremony created so much ambiance to the wedding too. The large group shot with the horse and carriage, was one of the most hilarious parts of the day. Not wanting to startle the little pony, I asked everyone to quietly hip-hip-hooray and put their hands in the air. The entire group did just exactly that! It was awesome! After the couple’s wedding carriage ride, we ventured upstairs to a stunning reception room. Corina Silva did a stunning job with the design of the ceremony and receptions atmosphere. It was filled with tasteful decor, lovely personal touches, and bold colors. Who could forget the dance off?! Jeffery was so laid back and entertaining and Kerri’s choices proved to be top notch in all respects, even after the wedding. It’s becoming more rare to receive thank-you notes. I was pleasantly surprised to open my mail box and find envelopes for me and my assistant. Every thoughtful and purposeful action of their wedding was a reflection of who the couple were as people. I whole-heartedly enjoyed our letters. I have deep gratitude and fond memories of Kerri and Jeff, and look forward to keeping in touch with the bride and groom. Last but not least, yes, they are living happily every after! To see more of their special day, check out their wedding video in the link below! Cake: Krystal Agic at Cake That Inc.